Tie the pork loin with a twine and rub the meat with sea salt and freshly ground black pepper to flavour the pork. Put a few tablespoons of olive oil and a knob of butter on the bottom of a cast iron skillet and let melt the butter over high heat. Add two cloves of crushed garlic. Place the pork loin into the hot olive oil and let it brown on each side, turning the meat with two wooden spoons as soon as it gets golden brown. 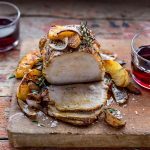 You are going to use wooden spoons or spatulas not to prick your beautiful piece of pork: you want the meat to be completely sealed by the heath of the olive oil on the outside and all the juices to be kept inside, to have a tasty and juicy roast! It will take about 10 minutes. Pour in half a glass of white wine over the pork loin and let almost all the wine evaporate. Now reduce the heat and add the peeled apples and onions, all cut into wedges. Stir with a wooden spoon to coat the apples and the onion with the olive oil and cover the pot with a lid, then cook the meat over medium heat for about 25 up to 30 minutes, checking it occasionally. Remove the meat from the cast iron pot, wrap it with aluminum foil and let it rest. In the meantime, turn up the heat under the pan with the apples and cook for 5 minutes over high heat to reduce the sauce: you can serve the meat, cut into thin slices, with the apples and the onions just as they are out of the pot, caramelized and soft, or you can purée them to dress the meat with a creamy and sweet gravy.